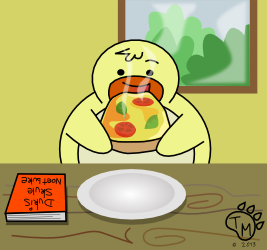 Ducky loves pizza day at school. He is always the first one to the cafeteria, he flashes a big smile at the lunch ladies, and he asks for a large slice of Margarita pizza. Mmm… Mmm… PIZZA! Every day should be PIZZA DAY!!! !